Alex Rogo is a harried plant manager who has been given 90 days to save his failing factory. If he doesn't improve the plant's performance, corporate headquarters will close it down and hundreds of workers will lose their jobs. It takes a chance meeting with Jonah, a former professor, to help him break out of his conventional thinking and figure out what needs to be done. As Alex identifies the plant's problems and works with his team to find solutions, the reader gains an understanding of the fundamental concepts behind the Theory of Constraints. 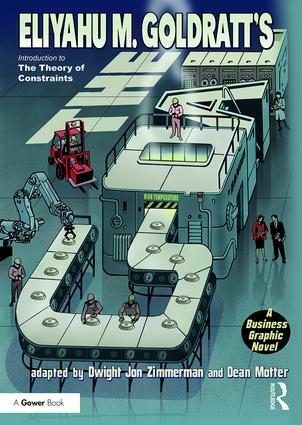 Visual and fun to read, The Goal: A Business Graphic Novel offers an accessible introduction to the Theory of Constraints concepts presented in The Goal, the business novel on which it was based. The Goal is widely considered to be one of the most influential business books of all time. A bestseller since it was first published in 1984, the business novel has sold over 7 million copies, been translated into 32 languages and is taught in colleges, universities, and business schools around the world. Named to Time magazine's list of the 25 Most Influential Business Management Books, it is frequently cited by executives as a favorite or must-read title. Dr Eli Goldratt's book, The Goal, has been a bestseller since 1984 and is recognised as one of the bestselling management books of all time, having sold over 7 million copies worldwide. Eli Goldratt was the author of many other books including the business novels, It's Not Luck (the sequel to The Goal), Critical Chain, Necessary but Not Sufficient and Isn't It Obvious? Dr Goldratt was the founder of TOC for Education, a nonprofit organisation dedicated to bringing TOC thinking and tools to teachers and their students (www.tocforeducation.com) as well as Goldratt Consulting (www.goldrattconsulting.com). Dwight John Zimmerman is a #1 New York Times bestselling author, edutor and president of the Military Writers Society of America. He has written more than a dozen books, including Lincoln's Last Days, the #1 New York Times bestselling adaptation of Killing Lincoln by Bill O'Reilly, and Uncommon Valor: The Medal of Honor and the Warriors Who Earned It In Afghanistan and Iraq which won the 2010 Military Writers Society of America Founder's Award, the organisation's highest honour. He has written more than 300 articles on military history, as well as comic book stories for Marvel Comics and other comic book publishers. As art director and designer for CBS Records, Byron Preiss Visual Publications and DC Comics, illustrator Dean Motter has created a plethora of award-winning book and record jackets. As a graphic novelist he is best known for Terminal City, The Prisoner, Batman: Nine Lives and his seminal creation, Mister X. He has illustrated non-fiction comic books for the Davis S. Wyman Institute and the Los Angeles Holocaust Museum, including The Book Hiter Didn't Want You To Read and Karski's Mission: To Stop the Holocaust.